This entry was posted in Reading, Schooling, Thinking and tagged book review, Books, cultural history, David Skinner, dictionaries, Dictionary, lectures, lexography, literature, Merriam-Webster, Noah Webster, Peter Sokolowski, philosophy, reference books, Smith College President, sociology, the dictionary as data, The Story of Ain't, Webster Dictionary, Webster's third edition, William Neilson, words. Bookmark the permalink. 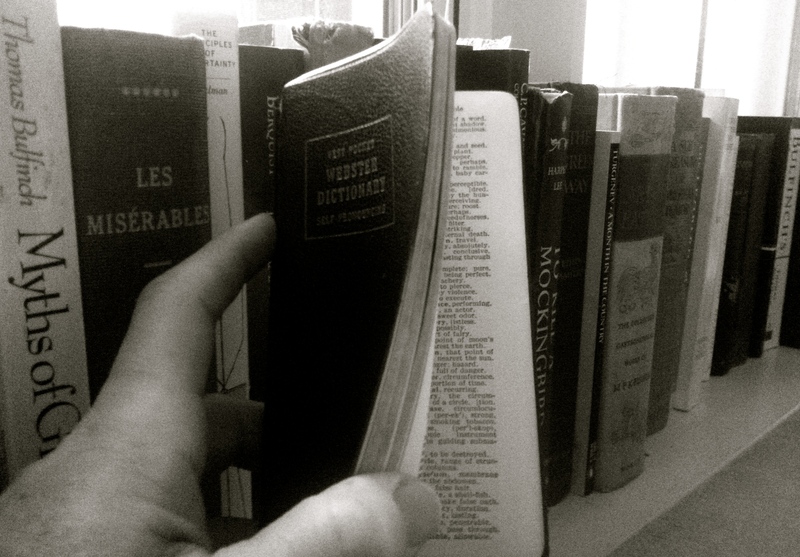 By the way, that vest pocket Webster dictionary brings back memories I had my older brother’s with me in 5th grade and entertained myself and friends by looking up words like “damn” and “hell.” Definitely, different times! Of course, the real difference is that today, your dictionary knows exactly what you are looking up – no more sneaking about with a pocket dictionary! “Damn” and “hell” – oh gee, that is sweet. maybe we should be grateful for all the words that are left out, how big would the dictionary need to be to include them all? Before the Third Edition there was some sort of idea (Ideal) that a dictionary could contain everything…it was not a smooth disillusionment. I looked up woman, female and male, man for purposes of a poem – on my blog back there somewhere. It’s difficult to explain. Words are a difficult vehicle to explain just about anything. I’ve no idea how we understand each other. (I giggled right through this post.) I own a Very Old Websters: The Consolidated Webster Encyclopedic Dictionary, published in 1947. Got it from a second hand book store for dirt cheap. It’s 8cm thick. I know. I look them up for all sorts of reasons…sometimes just to find a definition that more closely defines the one I have in my head – I do the same with translations (which I guess, definitions, by definition- haha -may be)… I just never knew anyone was taking note! Many thanks for a lovely post. Is the name of your blog a reference to the song “Too Marvelous for Words”? One of my favorites (naturally). By coincidence, I posted a Sinatra version on Twitter just before finding this blog. Wonderful song! Sadly no. I’m afraid the inspiration for my blog name comes from a rather more cynical bit of repartee: Bette Davis (Who better?) as Margo Channing in one of my favorite films, All About Eve.